Thank you for participating. You can all go home now. By harnessing that cute, funny and occasional mysteriousness you might come up with one of the Internet’s most widely enjoyed phenomena – memes! If any of your time online is spent wasting it, then you probably have a favorite meme or two along with several others that vex your sensibilities. These bits of ideas and concepts that spread like wild would appear to be an advertiser’s best friend. Yet seizing the Internet zeitgeist for a campaign is not easily accomplished – partly because what is hot on the world wide webs right now might not be a week from now. On top of all this, memes have a rather unique trait: they’re pure. Not in the sweet, innocent kind of way (not even close), but in the non-commercial kind of way. Where memes are social by nature, “viral” marketing is really only successful if it’s strong enough to become social. The Internet practically runs on advertising, which means people are incredibly skilled at identifying it, and if you are trying to disguise your ad as something else, said Internet folk will know and probably not care for it. So can memes then become commercial vehicles? It has happened, and it isn’t just a one-way street. Embracing the essence of popular online culture, the absurdly charming Old Spice Man & your local taxidermist, Chuck Testa, are examples of adverting evolving into its own meme. As Old Spice benefited from a massive interactive media run, the face of Ojai Valley Taxidermy – Chuck Norris? 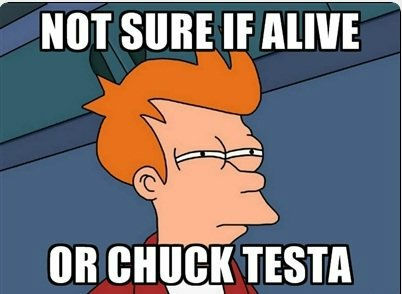 Nah, Chuck Testa – came out of nowhere. Even after Mr. Testa’s commercial was featured on an obscure cable TV show, it took another month before the YouTube version was discovered by Reddit and subsequently meme-ified, as Nope! Chuck Testa was born. While it is unclear if more people are adding stuffed animals to their decor these days, at the very least they know who to recommend. Coming from the other direction, Wonderful Pistachios has virtually raided the Internet cookie jar. Maybe “raided” is a bit harsh; only a small percentage of their Get Crackin’ campaign includes a direct tie to the web. The Honey Badger spot (below) was well-played and fit the original tone, though it would take a lot to ruin of one Randall’s sassy narrations. Keyboard Cat, however, resorted to a lame pun (“Puuurfict”? For reals? Only Angela from The Office would find that amusing) and probably could have been better written had the keyboard been replaced by a typewriter. We have to give them credit for at least staying away from Nyan Cat. Obviously, there is only one product that flying feline should be shilling. Almonds. As usual, humor is king. Even with the niche groups a lot of memes are exposed to and resonate with, incorporating a popular one into a well-executed campaign can echo among the masses. Funny is funny, though familiarity is not always a good thing. The difference between a blow to the groin and archaic rap lyrics? Clever writing. Yet, no matter what the next witty meme is to live a full, 16-day life on the Internet, there will be a dozen beer, chips, and beef jerky commercials featuring a nut shot. Why? Well, no one said pandering to the masses would always be cutting edge. But that is another question this article doesn’t have the attention span to fully analyze. We’re just trying to keep up here. This entry was posted in Online and tagged brilliant, internet, meme, viral, wait what?. Bookmark the permalink.